For a better experience using this site, please upgrade to a modern, supported web browser. An issue with our 384-well plate files for all designs created for the Ion AmpliSeq™ HD technology was identified and is now fixed. This issue affected all designs with the prefix “IAH”, and was responsible for the incorrect mapping of the oligo location within each well. The 384-well plate files for designs created prior to March 17, 2019, will be fixed on a rolling basis. If you have ordered an Ion AmpliSeq HD design in the 384-well plate format before March 17, and you wish to do partial pooling, please contact your local support team or reach out to our global support for further guidance on how to deal with this issue. The new Ion AmpliSeq™ Microsatellite Instability Research Panel can be used to study Microsatellite instability (MSI) which has been associated with hypermutability of short DNA sequence repeats and defects related to the mismatch repair (MMR) system. This has been observed in diverse cancer types. The panel contains a single primer pool that amplifies a total of 76 amplicons to assess the MSI status from FFPE DNA of human cancer tissue sections. The new Ion AmpliSeq™ Methylation Panel for Cancer Research can be used for analysis of clinically relevant targets for identification of specific methylation patterns within a DNA sample using targeted bisulfite sequencing. The panel contains 40 amplicons (including 2 control amplicons) to detect methylation status of 38 targets including targets associated with colon cancer, prostate cancer, leukemia, and lymphoma. A small alert will now be displayed for designs containing greater than 275bp amplicons. From the alert the user can determine if additional flows are required for complete end-to-end coverage of the longest amplicon in their panel. A new histogram will be available from the user interface for users to visualize the amplicon distribution content. The image will be available for download, as well as part of the download zip bundle. We have updated our support for the COSMIC database to version 86. Support for older versions of COSMIC will not be available, however users can always enter genomic coordinates if obsolete annotations are needed. As of version 7.0.5 we have increased the limit from 2 to 5 simultaneous designs created. A higher limit enables the flexibility to our users to get to their ideal design faster. The amplicon range for cfDNA solutions generated for AmpliSeq HD designs has been further optimized to increase in-silico coverage. The new range is now from 75-125bp amplicons for the AmpliSeq HD cfDNA solutions. Older cfDNA solutions (75-100bp) will no longer be created, but solutions that were previously created will remain accessible in the user's account. Ability to synthesize at 5X. Synthesis at 50X for Spike-in use (BED file modifications still need to be performed by the user. Consult your local FBS for help). Larger scale option for pooled tubes only at either 2X or 5X concentration. Option for plates only orders (no pooled tubes to be included). Ion AmpliSeq HD panels leverage molecular tags to achieve ultra-high levels of sensitivity. Ion AmpliSeq HD panels are only compatible for use with the new Ion AmpliSeq HD Library Kit (SKU: A37694) and Ion AmpliSeq HD Dual Barcode Kit 1-24 (SKU: A37695). The Ion AmpliSeq HD panels are fully customizable and are only supported for the hg19 genome at this time. A new design type for cfDNA is now offered with an exclusive amplicon range of 75-100bp. The new amplicon range reflects design optimization that has been done for cfDNA using the Ion AmpliSeq HD chemistry. The previous range 125-140bp for cfDNA will not be offered for Ion AmpliSeq HD; however, it will remain available for regular Ion AmpliSeq designs. Our site is now organized based on the chemistry that supports the multiple applications. On the left side the Ion AmpliSeq technology is hosted, and the different applications are organized in tabs. On the right side the new Ion AmpliSeq HD technology is found, and the button to start a new Ion AmpliSeq HD is provided. Additional enhancements such as mouse hover over on the top bar allow easy navigation to the desired designs. The designs page is organized in 3 categories: 1) On Demand, 2) Made-to-Order and 3) Ion AmpliSeq HD. The new organization provides a better way of finding your designs by product category or by underlining chemistry. 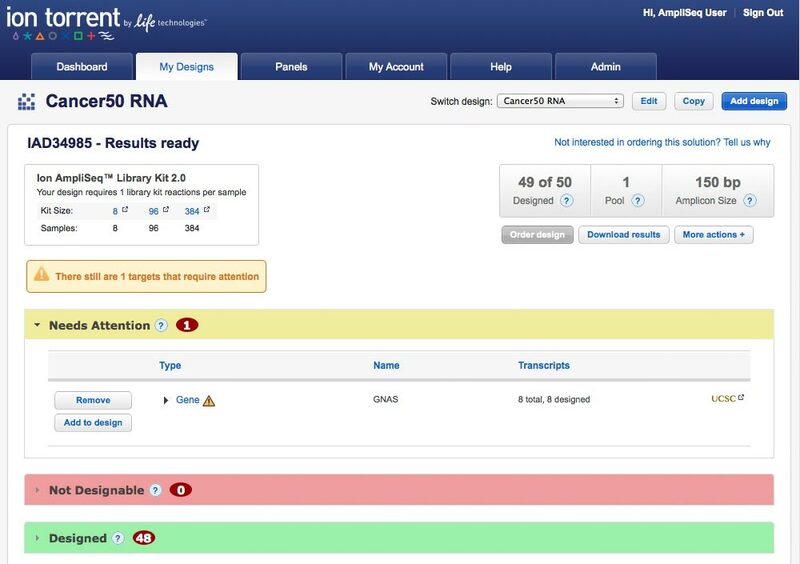 Made-to-Order and Ion AmpliSeq HD categories also offer a quick button to display DNA or RNA designs only. 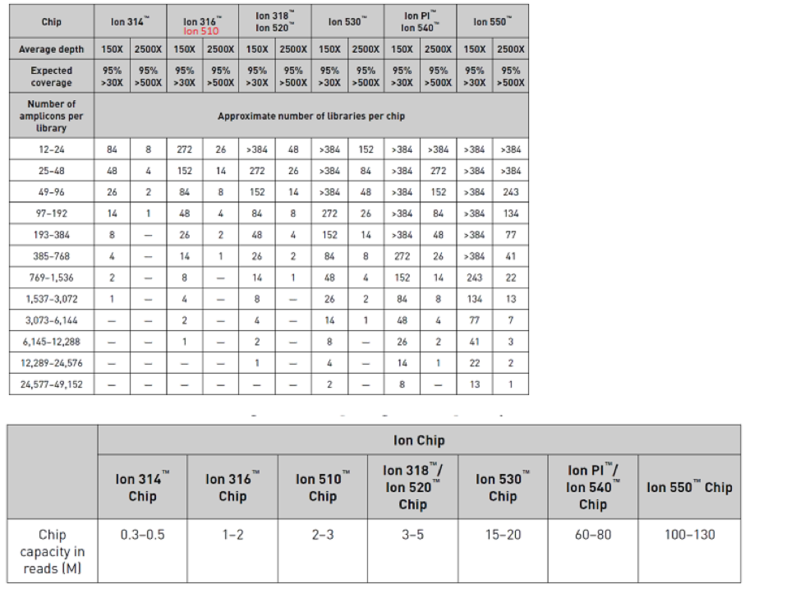 Chip Calculator: Do not display “Approximate # Library Samples/Chip” table for Ion Gene Studio Instrument and 550 chip for S5/S5 XL Instrument. Please find below table as reference for the same. Copy amplicons from Fixed Panels into AmpliSeqHD designs is not allowed in this version of AmpliSeq Designer. Adding Amplicons from Fixed Panel using Amplicon ID would result into error on UI. Support for our new Ion GeneStudio S5, S5 Plus and S5 Prime Sequencers and 550 chip. The new Ion GeneStudio Sequencers and 550 chip were launched on Jan-08-2018, and with this update we’re providing full compatibility within Ion AmpliSeq Designer. The new Ion GeneStudio Sequencers and 550 chip represent a new exciting flexible offer for high performance bench-top NGS solutions. Updates to the plan.json file for the Ion AmpliSeq Exome Panel to support data from 540/550 chip. New updated parameters for the Ion AmpliSeq Exome Panel are now available through a new version of the plan.json file, for improved variant calling on data from 540/550 chip. The Ion AmpliSeq Transcriptome Mouse Gene Expression Research Panel is used to measure expression levels of 23,930 RefSeq genes using only 1 pool. The panel targets 20,767 well annotated RefSeq genes and 3,163 coding and non-coding genes with provisional annotation based on Genome Reference Consortium Mouse Reference 38 (GRCm38). All amplicons are of approximately 150 bases in length. We recommend sequencing 8 samples on a Ion 540 Chip or Ion PI Chip. Circular RNAs (circRNAs) were recently discovered as a novel class of noncoding RNA that are widely expressed in various tissues. Although the function of the vast majority of circRNAs remains unknown, several of them have already been associated with human disease. Currently, there is lack of essential approaches to study circRNAs. A target-enrichment sequencing method suitable for high-throughput screening of circRNAs and their linear counterparts in large sample sets were developed using AmpliSeq technology. The benefit of accessing verified content with the flexibility of customization. The new Ion AmpliSeq On-Demand panels have been optimized and verified similarly to our Ready-to-Use panels, while offering gene level customization for flexible panel creation. Visualization of wet-lab verified data is now readily accessible through our new IGV Lite tool. 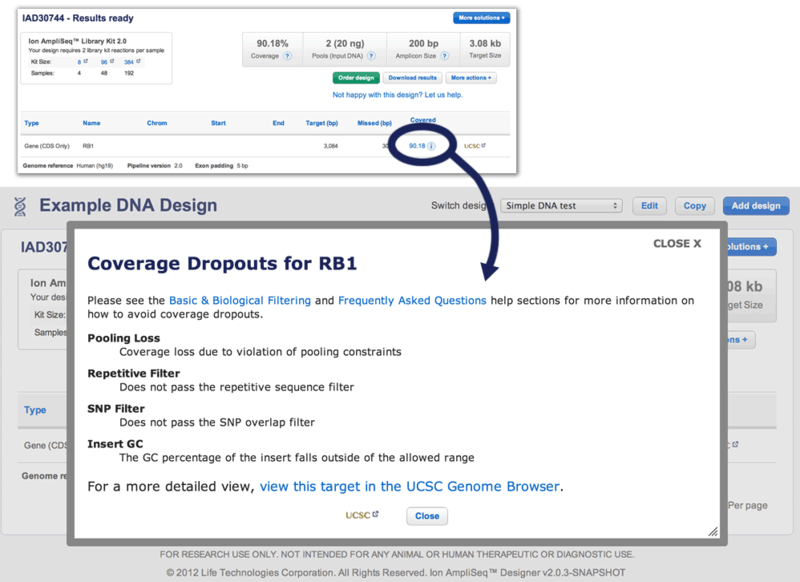 Click on a gene to access the expected coverage data at the amplicon level without having to use an external tool like the UCSC genome browser. A new visualization mode known as the “Grid view” has been created to help you review the design of your Ion AmpliSeq On-Demand panel, and to facilitate adding or removing content. Once you’re ready to order, order your panel in small reaction packs offered at affordable prices. The small reaction configuration of the Ion AmpliSeq On-Demand panels helps lower the price per sample, making custom gene panels more accessible than ever. With the Ion AmpliSeq On-Demand panels, a new tool has been developed to allow you to browse our catalog of genes that have been organized based on their association to various disease research categories. 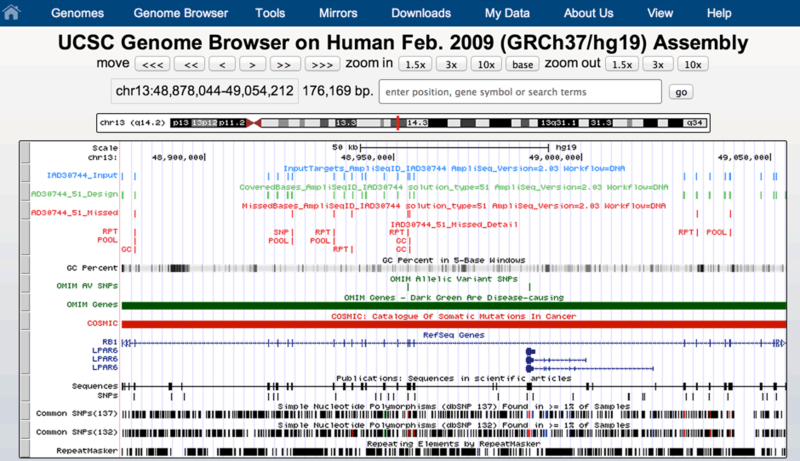 A multi-level browsing experience enables users to select genes starting with their specific research areas of interest. Selection of Disease Research Area categories can be made at any level, just keep in mind that up to 800 genes can be selected per panel for design creation and of that, 300 genes can be ordered per panel at this time. Our site is now organized based on content rather than by design workflow. 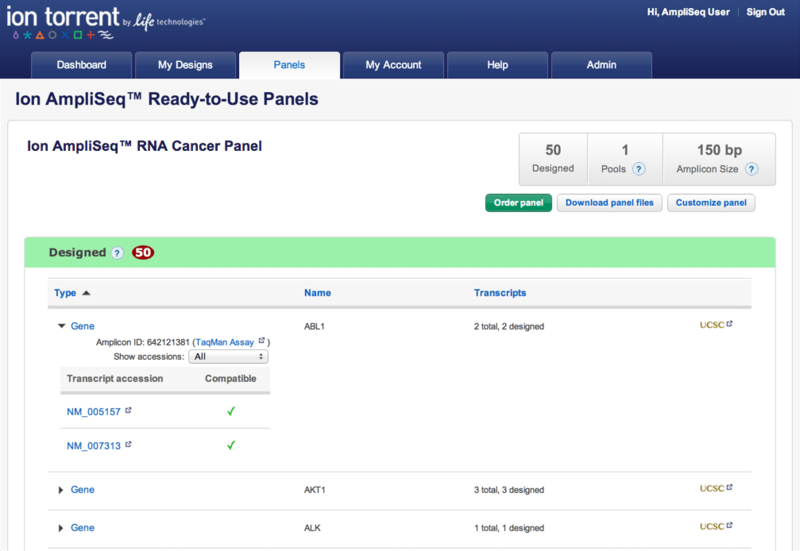 You can now easily browse the Ready-to-Use panels, select genes for On-Demand panels, or access the Made-to-Order panel workflow which enables our traditional custom design capabilities for ultimate flexibility. The menu bar on top of the page has been simplified allowing you to hover over the quick access buttons to see your designs in the Draft, Results Ready or Ordered stages. A new Notifications tool is also available to provide you the latest important communications from the Ion AmpliSeq Designer team. After an On-Demand design is created, genes added using the Add Gene tool are not categorized correctly when using the “Group by: Disease Research Area” function. Currently the genes will be categorized under “Added” rather than their respective Disease Research Area group. During the design review stage, the “Group by: Disease Research Area” option should list all the genes that have been pre-selected under the original Disease Research Area category. In the future, this will include both the genes that are available and not available in our On-Demand catalog. However, only the genes that are available in our On-Demand catalog will appear under this category at this time, while the unavailable genes will appear in the “Unclassified” category. At this time, when an On-Demand panel is cloned, the genes that are available On-Demand will be re-selected while genes that are not available will be deselected by default. Preserving the user selections and de-selections after using the cloning option is currently not supported. The filtering functionality in the IGV tool which allows users to view specific genomic positions based on Expected Coverage values is not working as expected at this time. Data ranges do not get correctly filtered. When an incorrect gene symbol is uploaded via the Gene List option in the homepage or via the Upload file option after a panel has been already created, the user will have the option to download the list of unrecognized genes as a file. The downloaded file should contain the “.CSV” extension; however our current download does not include this extension. The user will need to add the CSV extension to the file and correct the gene symbol, prior to being able to upload the list into the Ion AmpliSeq Designer website. New support for creating custom designs using the GRCh38 (hg38) genome. We now support creation of custom designs using the latest publicly available human genome called hg38. Please note that support is limited to the consensus contig, and a new alternate contig containing the GSTT1 gene. This gene will no longer be located in Chr22 but on the new alternate contig. All other alternate contigs are not supported in this release. 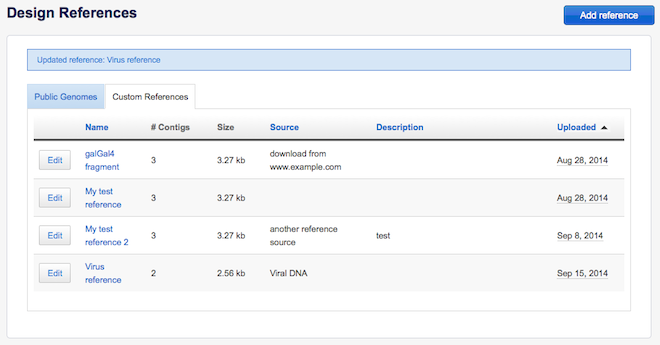 Updates to the plan.json file for the Ion AmpliSeq Exome Hi-Q panel. New updated parameters for the Ion AmpliSeq Exome Hi-Q are now available through a new version of the plan.json file, for improved variant calling. Two new Ion AmpliSeq BRCA Community panels for cancer research now available. The new Ion AmpliSeq BRCA Reflex, Hereditary Cancer Research Panel is a 2 pool panel with 610 amplicons, and contains 25 hereditary cancer-related genes which have a central role in DNA repair and mismatch repair pathway. The new Ion AmpliSeq BRCA Plus, Extended Hereditary Breast and Ovarian Research Panel, is a 3 pool panel with 699 amplicons that targets 11 genes known to harbor mutations related to breast and/or ovarian cancer. Ion AmpliSeq RNA MAPK Pathway Panel - this panel is involved in Cell Cycle & Proliferation, Virology and Signal Transduction. Ion AmpliSeq RNA Human Cancer Pathways Panel - this panels includes a large number of genes that are involved in DNA repair, angiogenesis, cell adhesion and extracellular matrix, as well as cell cycle and apoptosis. Ion AmpliSeq RNA Inflammation Response Panel - this panels targets numerous genes that are taking part in key pathways of inflammation response that include chemokines. Ion AmpliSeq RNA WNT Signal Pathway Panel - this panel includes a list of genes that are responsible for the regulating the production of WNT signaling molecules. Ion AmpliSeq RNA Pancreatic Adenocarcinoma Panel - this is a panel that targets genes known to be over-expressed in Pancreatic carcinoma. Ion AmpliSeq RNA Breast Cancer Panel - this is a very comprehensive panel targeting over 1,100 genes involved in breast cancer development and progression. New automated in-silico histogram for custom designs. As part of our output files, we now include an in-silico histogram publication quality image to help visualize the amplicon insert size distribution of our custom designs. The image includes on the X-axis the Amplicon Insert Size in bp units, and the Amplicon Count on the Y-axis. Information on the total number of amplicons in the design and their size range is also provided. Additional new Ion AmpliSeq™ Research Panels for Inherited Diseases Research Area. These new panels provide greater focus for research and expand the breath for which the Ion AmpliSeq technology can be used for. To order, please use the “Add to Cart” or “Request quote” or “Request Information” buttons. For the request information button, you will need to provide your contact details and a representative of our team will be in touch shortly. Our new Ion AmpliSeq Designer 5.0 has been improved to bring a workflow based approach to creating, reviewing and ordering your designs. With this new version, you will find that navigating through the application has never been easier, and getting to where you need to go is only a click away. Our Ion AmpliSeq Research Panels known as Ready-to-use and Community Panels, have been reorganized by default to fit within common research areas where targeted sequencing is used. You will now find direct links from the home page to important research areas which you may review without the need to register or log in. Once you’re ready to order, you will need to sign in to your account and proceed with the ordering process. As a reminder, the new S5 and S5 XL have been launched on September 1, and we provide full compatibility within Ion AmpliSeq Designer. The new S5 and S5 XL systems represent a new exciting offer for high performance bench top sequencers. Ion AmpliSeq™ Cardio Panel – To be available in 8 reaction and 32 reaction Chef-ready-trial kits. Ion AmpliSeq™ Hematology Panel – To be available in 8 reaction and 32 reaction Chef-ready-trial kits. Ion AmpliSeq™ Neurological Panel – To be available in 8 reaction and 32 reaction Chef-ready-trial kits. Ion AmpliSeq™ Ophthalmic Panel – To be available in 8 reaction and 32 reaction Chef-ready-trial kits. Ion AmpliSeq™ Pharmacogenomics Research Panel – To be available in only 32 reaction Chef-ready. Based on customer demand, for a limited time, our Custom Gene Fusion panels will continue to be priced the same as traditional RNA Gene panel designs. As a reminder, the variant analysis workflow for Custom Gene Fusions is exclusively provided by Ion Reporter™. For more information please visit the Ion Reporter™ site here. The new Ion AmpliSeq™ TB Research Panel used for targeting genes associated with antimicrobial resistance is now available. This panel consists of 109 amplicons in 2 pools to provide a quick, accurate and cost effective means to identify variants in 8 genes (embB, eis, gyrA, inhA, katG, pncA, rpoB, rpsL) associated with antimicrobial resistance in Mycobacterium tuberculosis (TB). The new Ion AmpliSeq™ Pharmacogenomics Panel is a single pool panel of primers used to perform multiplex PCR for the preparation of amplicon libraries from genomic “hot spot” regions that play a critical role in DME genes. By focusing on 136 well documented SNP and indel variants that captures CYP2D6 copy number variations at both the gene level and the exon 9 rearrangement, the panel enables screening of a broad selection of haplotypes including *36. This targeted, ready-to use panel provides high value pharmacogenomics content while remaining flexible by allowing user customization. We have added a collection of 13 new panels involved in various Inherited Disease areas to complement our existing offerings in this field. This new menu of Ion AmpliSeq Research Panels offers a broad selection of targeted panels that enable researchers to survey across collective sets of genes that have been scientifically curated as the most likely suspects for containing a candidate mutation based on criteria such as phenotype and disease. Panels represent a wide range of inherited conditions from cardiovascular to dermatological disease. Use of our Ion AmpliSeq™ Technology enables coverage of up to 766 genes employing a straightforward and rapid PCR based workflow requiring as little as 10 ng of input DNA. The panels can be used as-is or can be further customized through Ion AmpliSeq™ Designer to easily remove or add additional amplicons. The Ready-to-use and Community Panel interface has been redesigned to allow visitors easier access to our family of pre-designed panels. 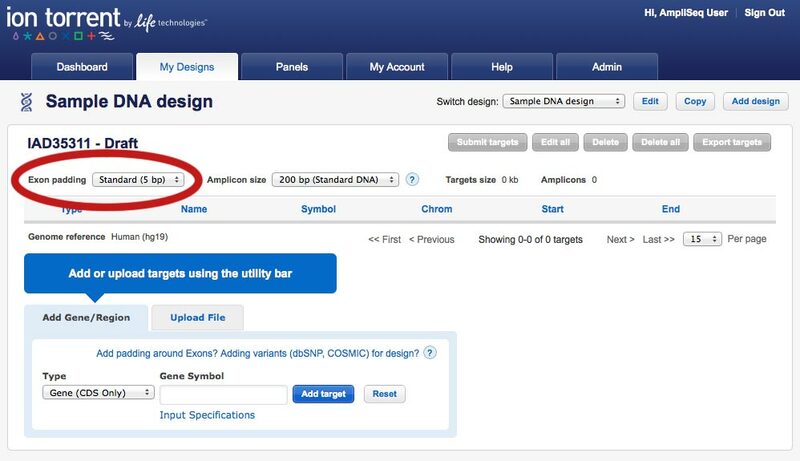 Site visitors can review the content of our panels without the need to register or log in to an Ion AmpliSeq™ Designer account. For a limited time, new Custom Gene Fusion panels will continue to be priced the same as traditional RNA Gene panel designs. Variant analysis workflows for Custom RNA Gene Fusion designs are exclusively provided by Ion Reporter™. For more information please visit the Ion Reporter™ site here. New trial sizes available for 4 Inherited Diseases Research panels and the Pharmacogenomics Research panel. Ion AmpliSeq™ Cardio Panel – Available in 8 reaction and 32 reaction Chef-ready-trial kits. Ion AmpliSeq™ Hematology Panel – Available in 8 reaction and 32 reaction Chef-ready-trial kits. Ion AmpliSeq™ Neurological Panel – Available in 8 reaction and 32 reaction Chef-ready-trial kits. Ion AmpliSeq™ Vision Panel – Available in 8 reaction and 32 reaction Chef-ready-trial kits. The new Ion AmpliSeq Ebola Panel was developed as a quick, accurate and cost effective method to identify the present of Ebola virus (EBOV). The panel contains 145 amplicons for targeting the Ebola gene. We have added a collection of 13 new panels involved in various Inherited Disease areas to complement our existing offerings in this field. This new menu of Ion AmpliSeq Research Panels offers a broad selection of targeted panels that enable researchers to survey across collective sets of genes that have been scientifically curated as the most likely suspects for containing a candidate mutation based on criteria such as phenotype and disease. Panels represent a wide range of inherited conditions from cardiovascular to dermatological disease. Use of our Ion AmpliSeq™ Technology enables coverage of up to 766 genes employing a straightforward and rapid PCR based workflow requiring as little as 10 ng of input DNA. These panels are comprehensively designed and can be used as-is or can be easily customized with the power of Ion AmpliSeq™ Designer to create phenotype based focused sub panels. This collection of panels are 2-pool and have over 99% coverage. Variant analysis workflows for Custom RNA Gene Fusion designs are exclusively provided by Ion Reporter™. For more information please click visit the Ion Reporter™ help section here. RNA Fusion designs creation has never been easier. 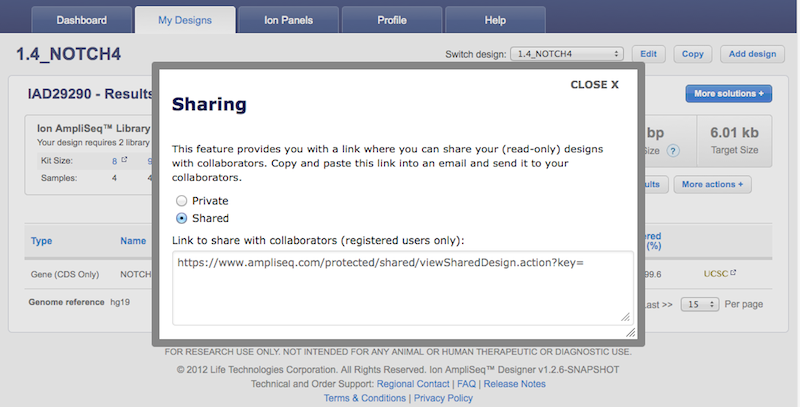 Simply input and select your fusion(s) of interest and let Ion AmpliSeq™ Designer do the rest. Support for gene fusion detection through highly targeted AmpliSeq™ assays is done using an extensive library of known fusion transcripts. For a limited time, new Custom Gene Fusion panels will be priced the same as traditional RNA Gene panel designs. The Ready-to-use and Community Panel search user interface has been redesigned to enhance the user experience and allow easier discovery of panels of interest. Import of custom gene fusion panel files into Torrent Suite™ 4.4.3 will fail. 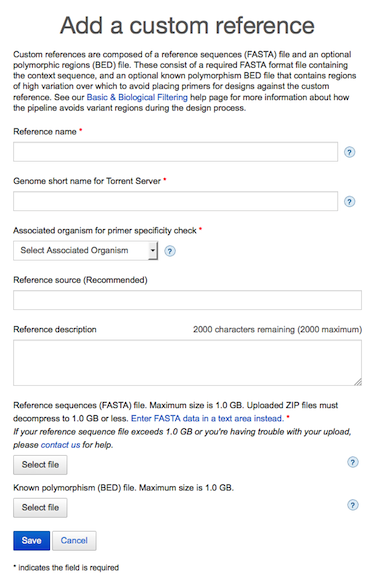 Users are encouraged to create a generic run plan in Torrent Suite™ for any custom gene fusion run. 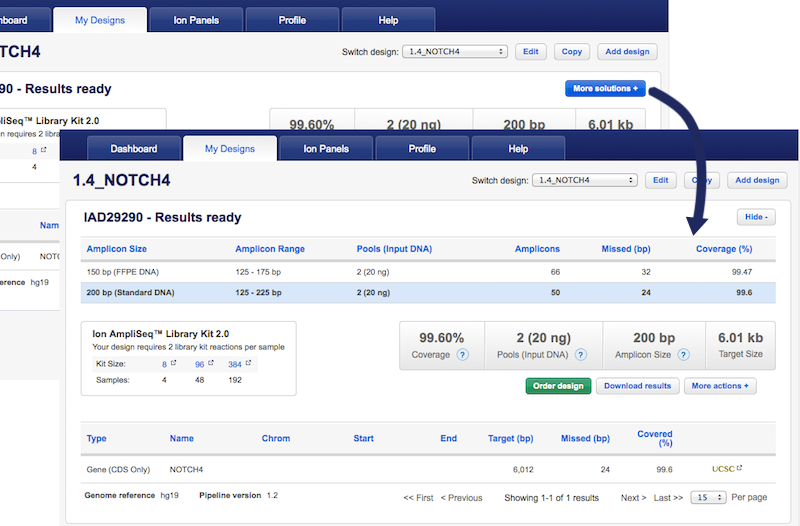 Full support of custom gene fusions will be available in Ion Torrent Suite™ 4.6. Please stay tuned for release updates. Create designs for cell free DNA (cfDNA) targets with our new 140bp amplicon solutions. Now the Ion AmpliSeq™ AML Research Panel and the Ion AmpliSeq™ Comprehensive Cancer Panel join the list of our panels that can be customized. Upload even larger design reference files! Our Custom Reference up-loader can support 2 GB uploads. However, users are encouraged to contact us to upload files of up to 4.0 GB if needed. New pre-loaded genomes now available! Upload larger design reference files! Users may now upload files of up to 2.0 GB. For more information contact: Ion AmpliSeq Assist or visit the Ion Ampliseq Assist site for more information. Longer 375 bp design solutions are now available by default and will be selected by default for newly-submitted designs when the DNA type "Standard DNA" is selected. We recommend these 375 bp solutions be used with germline DNA and the Ion PGM™ System for Next-Generation Sequencing coupled with the use of our new Hi-Q™ enzyme. Our 275 bp design solutions will remain available for existing and new designs. New Agrigenomics and Any Reference design solutions! Create designs for more organisms using new pre-loaded publicly available reference genomes. Is your genome not pre-loaded? No problem, load your own complete custom genomes or fragmented sequence contigs* and create your designs. * Additional help required for incomplete/fragmented genomes. Please contact ampliseq-designs@lifetech.com. 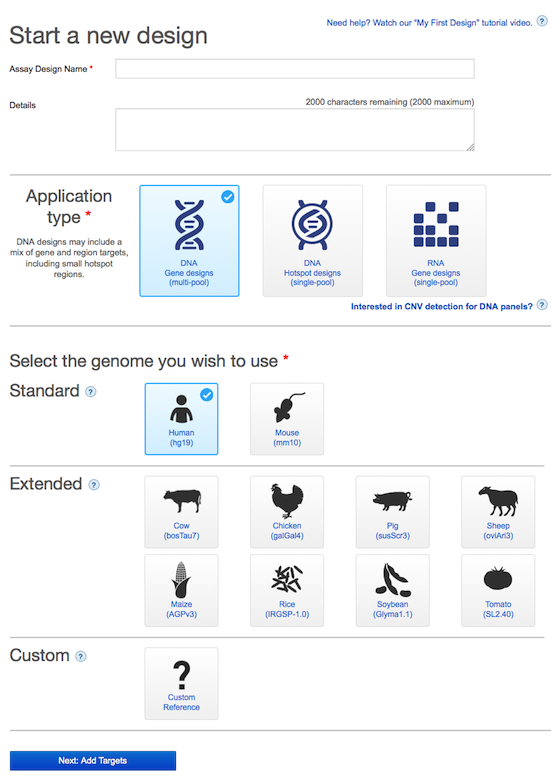 Manage your new custom genomes using our new easy-to-use genome management dashboard. Use available primer specificity check options to ensure your design success. Chat with one of our Product Information Specialists live to get help once you’re ready to place your order. Covers all protein coding regions including UTRs, intron/exon boundaries (20bp), 162 CFTR2.org mutations including 23 ACMG/ACOG mutations, four deep intronic mutations, and two large deletions (CFTRdele2,3 and CFTRdele22,23). Previous tiling methodology would favor multiple pool solutions to cover nearby hotspots. With current methodology, the algorithm looks for an optimal single pool solution avoiding amplicon overlap. The new algorithm seeks to position the hotspot close to the center of the amplicon. The benefit is that reads are mapped with higher reliability, and a greater probability of having reads from the forward and reverse strands, fulfilling the requirement for variant calling. The human RefSeq has been updated to the latest reference available in January, 2014 (RefSeq v63). This provides an updated reference for gene design. Powerful search/filter capabilities to quickly find pre-designed panels. The HID-Ion AmpliSeq™ Identity Panel is one of the first Next-Generation Sequencing (NGS) solutions for human identification that provides discrimination of individuals similar to STR genotype match probabilities used by forensic analysts. Improve in silico coverage by selecting designs with relaxed primer specificity. Choose the recommended design for best on-target % of sequence reads. Select the “increase coverage” button and immediately see higher coverage designs, if available. 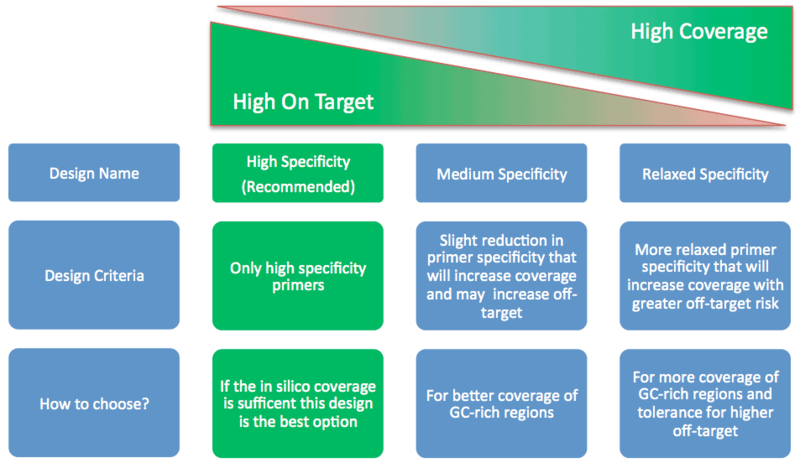 These pre-computed designs deliver increased coverage in GC-rich regions, while seeking to minimize off-target amplification. See the first such panel, the Dementia Research Gene Panel, under Community Panels. 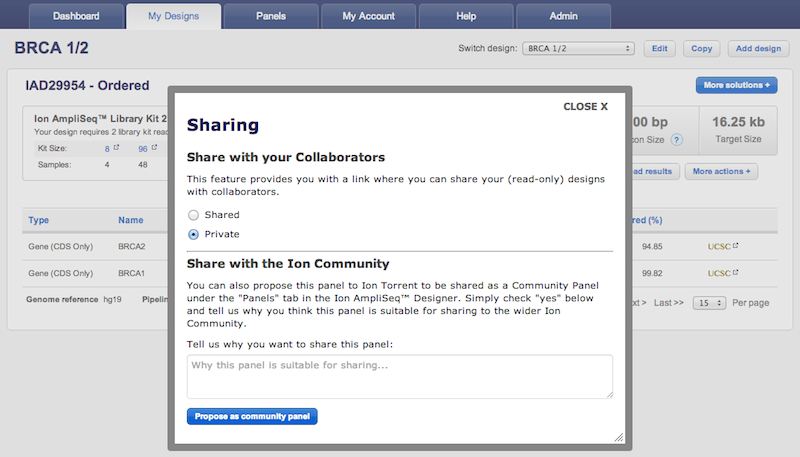 Transition to single sign on system on LifeTechnologies.com and improved ordering experience To streamline the process of ordering Ion AmpliSeq™ Panels, AmpliSeq Designer is transitioning user accounts from Ion Community accounts to Life Technologies accounts. Validate AmpliSeq™ RNA results with TaqMan™ assays. Check out the documentation on how to get corresponding assays here: TaqMan_IDs_AmpliSeq.docx (MS Word file), TaqMan_IDs_AmpliSeq.pdf (PDF file). 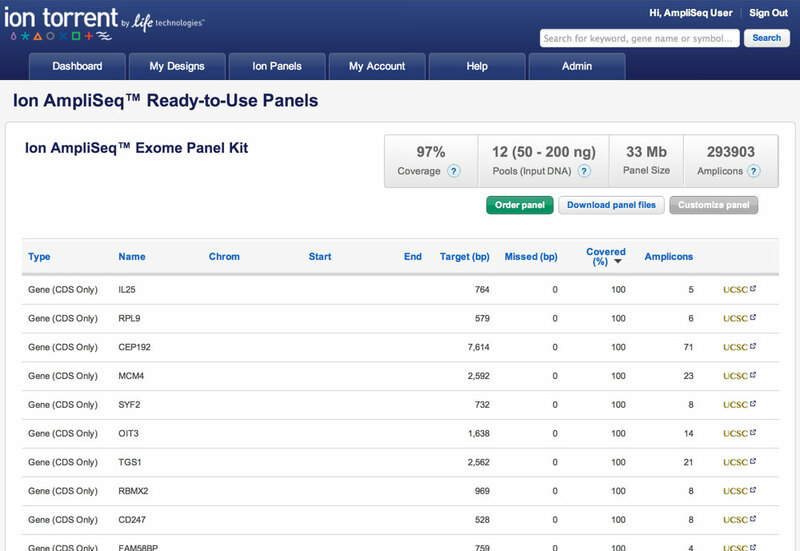 Introducing the Ion AmpliSeq™ Exome Panel panel. This is available under the "DNA Ready-to-use" panel tab. Increased in silico coverage for all standard DNA designs. For better in silico coverage of your existing panels you will have to redesign them. The amplicon range for standard DNA designs has increased to 275bp. The same 200bp sequencing kits can be used to sequence the longer amplicons. Ion Proton instrument supports short designs (125bp-175bp) for germline applications. DNA design results display specific reasons why a design cannot be confidently covered by an amplicon. Detailed information can be viewed using the UCSC Browser button. 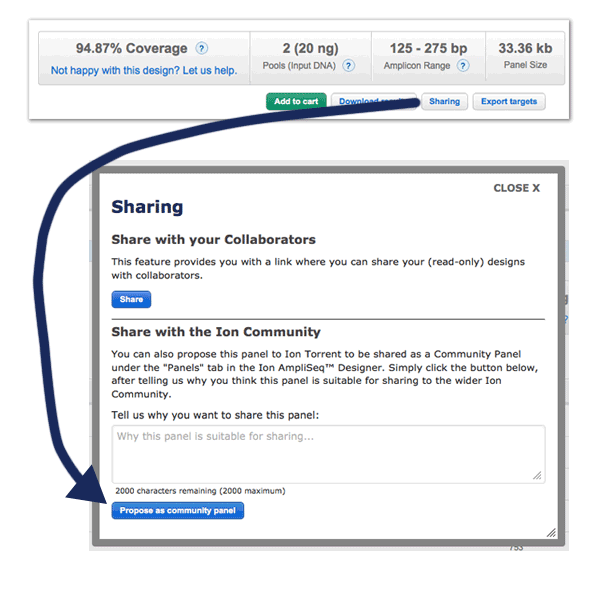 Search across ready-to-use and community panels, including the panel name, description, and gene names. New iterative tiling algorithm for AmpliSeq™ DNA designs. A cost-effective and easy-to-use human SNP genotyping panel comprising nine specially designed primer pairs that can be added prior to template amplification to generate a unique ID for each research sample during post-sequencing analysis. Use the Ion Library Equalizer™ Kit to normalize your Ion DNA libraries without the need for dilution or quantification, or the need for any additional equipment. You can now order designs that your colleagues have shared with you. Simply use the URL they’ve shared with you to review the design and then click the order button. Any ordered custom design can now be submitted to Life Technologies for consideration as a Community Panel. To submit one of your designs please complete the form found in the Sharing option under More Actions button on the review page. If you haven’t noticed yet, the AmpliSeq™ Training Videos have been updated to include even more great information. Check them and other great resources out under the Help tab. If you’re new to AmpliSeq™ Designer be sure to check out the getting started guide. After receiving results from the AmpliSeq™ Designer pipeline you can now provide feedback to help us improve the application. You’ll find the feedback link in the top right corner of the review design page. We’ve also included some minor fixes and user experience improvements. Minor bug fixes and user experience improvements. The Ion Panels tab is now called Panels and includes new AmpliSeq™ Community Panels designed with leading researchers. AmpliSeq™ Community Panels are currently being testing and verified for performance and will soon be available for order. Significant performance enhancements to improve turn around time designing your custom assays. Profile tab is now called My Account, which has a new Order History page where see all your ordered designs in one place. Custom AmpliSeq™ panels are only compatible with Ion PGM™ 200 Sequencing Kit. Introduced a variety of performance enhancements and caching strategies to improve turnaround time. Added significantly more help documentation. Instantly compare designs with both 150bp and 200bp amplicon sizes. Simply click on “More solutions” to compare! Review, order or customize Ion Ready-to-use Panels. Share your designs with collaborators. New designs that have 12-23 minimum amplicons per pool may now be ordered. Existing designs that have 12-23 minimum amplicons per pool must be resubmitted before they can be ordered. The icon for the UCSC browser has been updated.